Green Building Council Indonesia engaged international professionals from the green building industry to speak at the Green Building Conference 2014, held on 8 – 9 May 2014 at Pullman Central Park Jakarta. The conference, entitled “Gain for future generation”, was attended by various participants, from college students, architects, urban planners along with the Surabaya City Mayor. 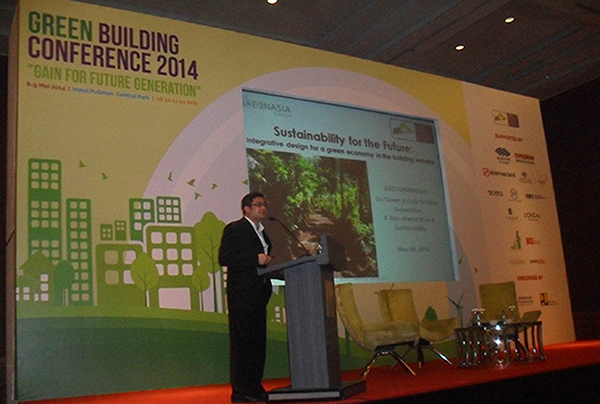 Vinod Kesava, TGAG’s Executive Director/COO, delivered a presentation with the topic ‘Sustainablility for the Future: To achieve the green economy in the building industry’. Vinod introduced the Integrative Design Process (IDP) and The 12 Pillars of Sustainability, both practiced in many of TGAG’s projects, demonstrating how to achieve savings in both CAPEX and OPEX, without compromising the tenets of sustainability.